Aesthetically, Brondell’s Circle filtration system is housed in a sleek compact design that contrasts the generally bulky appearance of conventional reverse osmosis systems. The H2O+ Circle also includes a chrome faucet. This product utilizes newly developed patented technology to cut down on waste water by eliminating back pressure on the reverse osmosis membrane filter with a circular reservoir design. In addition to its high efficiency, the Circle system delivers water at a rate twice as fast as other non-electric RO filtration systems, while standing up against systems that include an electric pumping device. The H2O+ Circle comes equipped with a six liter tank which can be refilled in under an hour, while offering constant flow rates without the need for an electric pump. This product utilizes automatic filter flushing which significantly extends the life of its filters, while an included LED indicator informs the user when it is time to replace them. The filters on the Circle system utilize a twist and seal design to make replacement incredibly simple. As expected, Brondell’s Circle filtration system will remove harmful chemicals such as fluoride and lead from your water, in addition to improving the taste and odor of water run through the filter. With a compact design, the H2O+ Circle will appeal to customers with limited space under their sink to house the product and can be installed quickly by even the least tech savvy consumers. The system features four separate filters, including sediment, pre-carbon plus and post-carbon block filters, as well as a reverse osmosis membrane filter. The first three filters have an expected lifetime of around six months and can be purchased as a set for around $80. The reverse osmosis membrane filter can be expected to last about two years with a price tag around $90. The H2O+ Circle has been designed to be ten times more efficient than the average reverse osmosis filtration system, and wastes far less water than other products in the same category. Reverse osmosis filtration systems on average waste 24 gallons of water for every one gallon of drinkable water produced, but the H2O+ Circle cuts down this ratio by a marked difference, wasting only 2.1 gallons of water for every one gallon of filtered water. This drastic reduction of waste water makes the H2O+ Circle one of the most efficient reverse osmosis systems on the market today, a feature that will appeal to environmentally conscious consumers who are concerned about wasting the planet’s most precious resource. In addition to producing top notch products, Brondell has garnered a reputation as a company deeply concerned with customer satisfaction and support. Brondell stands behind their products, and as such the Circle RO system includes a one year warranty should you run into any issues with the device. To assure consumers of the quality of this filtration device, Brondell has had their product certified by the Water Quality Association, who awarded the Circle system a Gold Seal certification. While the features offered by the H2O+ Circle make it an outstanding product, they do come at a fairly hefty price tag in the neighborhood of $360. While this may seem like a high price, the cost of reverse osmosis systems vary greatly, as do their quality. Customers shopping for an RO filtration system should take into consideration the savings Brondell’s Circle will afford them in the long run, not only in terms of reduced waste water but in energy savings as this product doesn’t require electricity like many other RO systems do. Coupled with the one year warranty and long life of its four filters, these features make the H2O+ Circle a great value. 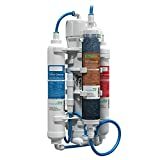 Brondell has outdone themselves with the H2O+ Circle, offering up one of the most efficient RO filtration systems on the market while drastically cutting down on water waste compared to other products in its category. 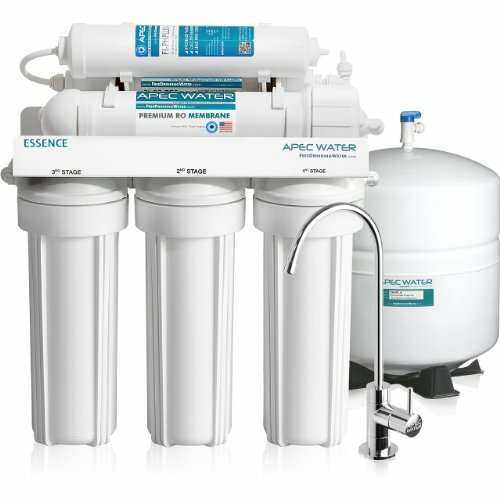 Simple installation and a pleasing, compact design means this product will appeal to a wide range of customers shopping for an RO system, and the long life of its four filters means you won’t be breaking the bank with constant replacement. 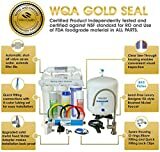 Brondell’s commitment to serving their customers and the WQA Gold Seal means consumers will have peace of mind when making the investment in the H2O+ Circle in addition to purer, better tasting water. With all of these features factored in, Brondell’s H2O+ Circle RO system is an exceptional product and of the best values on the market.